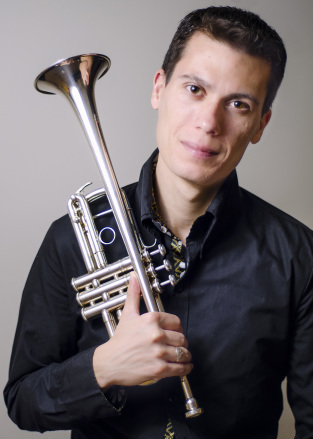 ﻿v﻿irtuoso trumpeter Carlos Manuel Zabala performs internationally as a soloist and chamber musician with the most diverse ensembles. In his tireless quest for new interpretations, Carlos is constantly working on discovering, arranging, and transcribing music from the most diverse styles and genres for both, trumpet and flugelhorn. From tango, bossa-nova, and traditional Latin American music to the standard classical repertoire, versatility and uniqueness among a passionate love for music-making describe him the best. He is recognized as one of the leaders of the new generation of emerging Latin American musicians. Carlos was born in Uruguay (South America), and in 2011 upon graduating from the Escuela Universitaria de Música (University School of Music of Uruguay) where he studied with Benjamin Browne, Carlos Manuel Zabala became the first person in the history of his country to achieve a Bachelor of Music degree in trumpet performance. Since May 2013, he holds a Master of Music in Performance from the Peabody Conservatory of Music (Baltimore, MD), studying with Edward Hoffman, Joe Burgstaller, and David Fedderly. He has soloed with chamber groups, orchestras, and bands; performing an impressive number of solo recitals, both with organ and piano. Among the Music Festivals where he teaches regularly are Alfredo de Saint Malo International Music Festival (Panama City, Panama), and Sembrando Talentos Uruguay. He leads trumpet and brass masterclasses around the globe, and is deeply involved in several outreach programs across the Americas. Currently he is a Teaching Artist for the OrchKids program of the Baltimore Symphony Orchestra. He has participated in world-class festivals such as Lucerne Music Academy (Switzerland), Weimar Bach Academy (Germany), Music Academy of the West (California, USA), Campos do Jordao (Brazil), among others. He Is the recipient of several scholarships and awards such as: Jeunesses Musicales (category A by unanimity, Uruguay, 2009); Mabelle Antoniette Leonhardsen del Mar Scholarship (United States, 2011-2013); James Stephenson Scholarship (United States, 2010); National Fund of Music (Uruguay, 2009 and 2012), among others.